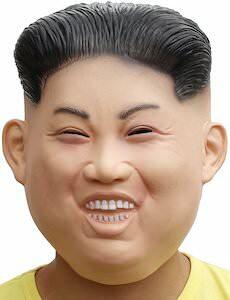 Now you can feel like the leader of North Korea all thanks to this Kim Jong-un mask. The latex face mask covers your whole head so that even from the back your look like Kim. Now Halloween or other dress up occasions are ready to see your Kim Jong-un version, just wear a suit and put on the mask and you are ready to be a world leader. The Kim Jong-un mask is one size fits most and will fit most adults and bigger kids (they say ages 6 and up) so that almost anyone can become Kim Jong-un and talk about North Korea.